An exciting opportunity to purchase a brand new three bedroom end of terrace house in a small block of just four properties, each of stone construction, located on this small and exclusive village development comprising of just 6 new homes and a barn conversion. The house is of a traditional construction with stone facing walls under a slate roof. It has accommodation of around 1,014 sq. ft. set on two floors comprising an entrance hall, cloakroom, a fabulous open plan living/dining room and a fitted kitchen with all appliances integrated. The landing leads to three double bedrooms to include a master bedroom with an en-suite shower room as well as a family bathroom. Outside space includes front and rear gardens and two parking spaces. These high specification stone built homes offer a great opportunity to own something a little bit different in a fabulous village setting - an early reservation is recommended. The Accommodation - This end of terrace house offers spacious accommodation of in the region of 1,014 sq.ft. in size. The hallway has stairs to the first floor and a cloakroom with WC and basin. The kitchen will have a comprehensive range of fitted and integrated appliances to include a built in single oven, gas hob, and extractor hood. Built in fridge/ freezer, and built in dishwasher. It will be fitted with a range of fitted units to floor and wall levels. The worktops will have a matching up-stand and an inset 1.5 bowl stainless steel sink unit. An L shape Lounge/ Dining Room located to the rear has French doors opening to the rear garden. 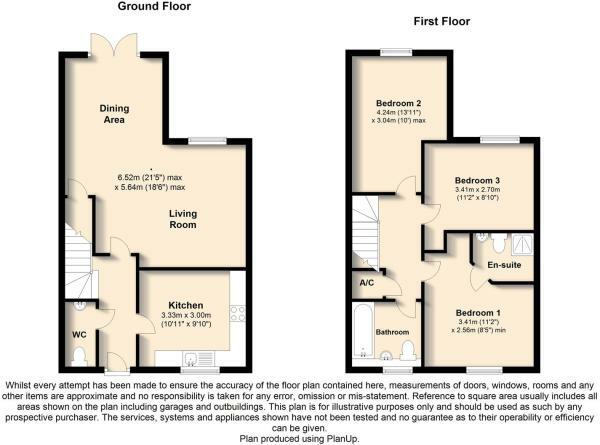 On the first floor the landing leads to three double bedroom to include a master bedroom with an en-suite shower room. The family bathroom has a suite comprising WC, basin and bath with shower over. Outside - The property has gardens to the front and rear, the rear garden enclosed by fencing with rear gated access. Two parking space to the immediate front. Floor Coverings - Floor covering can be provided if required. Contact us to discuss requirements and preferences. Agents Notes - The computer generated image on the front page shows No. 10 Reindeer Court. It is a brand new property under construction and the specification listed in these sales particulars may be is subject to change up to the point construction has been completed. The floor plan layout, room dimensions, and any reference to overall square area mentioned in these particulars may be subject to change. Please contact us if you require clarification of any specific points. Disclaimer - Property reference 27992714. The information displayed about this property comprises a property advertisement. Rightmove.co.uk makes no warranty as to the accuracy or completeness of the advertisement or any linked or associated information, and Rightmove has no control over the content. This property advertisement does not constitute property particulars. The information is provided and maintained by Fine & Country, Milton Keynes. Please contact the selling agent or developer directly to obtain any information which may be available under the terms of The Energy Performance of Buildings (Certificates and Inspections) (England and Wales) Regulations 2007 or the Home Report if in relation to a residential property in Scotland.